This is the story of how a Medieval Jew, the most unlikely of candidates for Christian baptism, became a Christian, despite the best efforts of the clergy—lightly adapted from the “Second Story” of The Decameron by Giovanni Boccaccio, a collection of stories told in 1348 by some bored Florentines seeking relief from the scourge of the Black Death. This amusing story shows how the worst of things prompted the best of decisions. It expresses, in a satirical manner, one of the great reasons I myself decided to become a Catholic—because the Church continued to stand athwart history, tenaciously consistent and stable despite the best efforts of Her clergy. My hope is that as this series continues, this assertion will become increasingly convincing. In the meantime, it’s time for a good—and instructive—laugh. Our story begins with Jehannot de Chevigny, a Parisian merchant. Jehannot had a Jewish friend named Abraham, and because he cared so much for his eternal soul, he decided to discuss the Christian faith with him. Abraham told Jehannot that he believed “no faith to be sound and holy except the Jewish,” and that the faith of his birth would be the faith of his death. Now listen, Jehannot, you would like me to become a Christian, and I am prepared to do so on one condition: that first of all I should go to Rome, and there observe the man whom you call the vicar of God on earth, and examine his life and habits together with those of his fellow cardinals; and if they seem to me such that, added to your own arguments, they lead me to the conclusion that your faith is superior to mine, as you have taken such pains to show me, then I shall do as I have promised; but if things should turn out differently, I shall remain as I am at present. He thereupon attempted to convince Abraham that a trip to Rome was not necessary. “[W]hy should you want to put yourself to the endless trouble and expense involved in going all the way from here to Rome?” he asked. Abraham rebuffed him, and insisted on visiting Rome, for if indeed what Jehannot was saying was true, it was worthy of Abraham’s investigation. As a result, Jehannot felt all but certain that Abraham, after seeing the rot and corruption in Rome, would never become a Christian. So Abraham returned home to Paris, disgusted by what he had seen. A bad one, and may God deal harshly with the whole lot of them. And my reason for telling you so is that, unless I formed a wrong impression, nobody there who was connected with the Church, seemed to me to display the slightest sign of holiness, piety, charity, moral rectitude, or any other virtue. On the contrary, it seemed to me that they were all so steeped in lust, greed, avarice, fraud, envy, pride, and other like sins and worse (if indeed that is possible), that I regard the place as a hotbed for diabolical rather than devotional purposes. As far as I can judge, it seems to me that your pontiff, and all of the others too, are doing their level best to reduce the Christian religion to naught and drive it from the face of the earth, whereas they are the very people who should be its foundation and support. Jehannot, though not surprised, was crushed. All of the hard work he had done to convince Abraham, all the proofs he had marshaled, all the arguments he had concocted—it had all been a waste as a result of Abraham’s visit to Rome. Since it is evident to me that their attempts are unavailing, and that your religion continues to grow in popularity, and become more splendid and illustrious, I can only conclude that, being a more holy and genuine religion than any of the others, it deservedly has the Holy Ghost as its foundation and support. So whereas earlier I stood firm and unyielding against your entreaties and refused to turn Christian, I now tell you quite plainly that nothing in the world could prevent me from becoming a Christian. Let us therefore go to the church where, in accordance with the traditional rite of your holy faith, you shall have me baptized. So he escorted Abraham to the cathedral of Notre Dame de Paris, and asked the priest to baptize him. As soon as the priest heard Abraham affirm that he had freely chosen to be baptized, they asked his sponsor for his new Christian name. “Call him ‘John,’” Jehannot said. And that is the story of how the Medieval Jew, Abraham, became a Catholic. Robert Speaight, The Life of Hilaire Belloc (New York: Farrar, Straus & Cudahy, 1957), 383. Giovanni Boccacio, G.H. 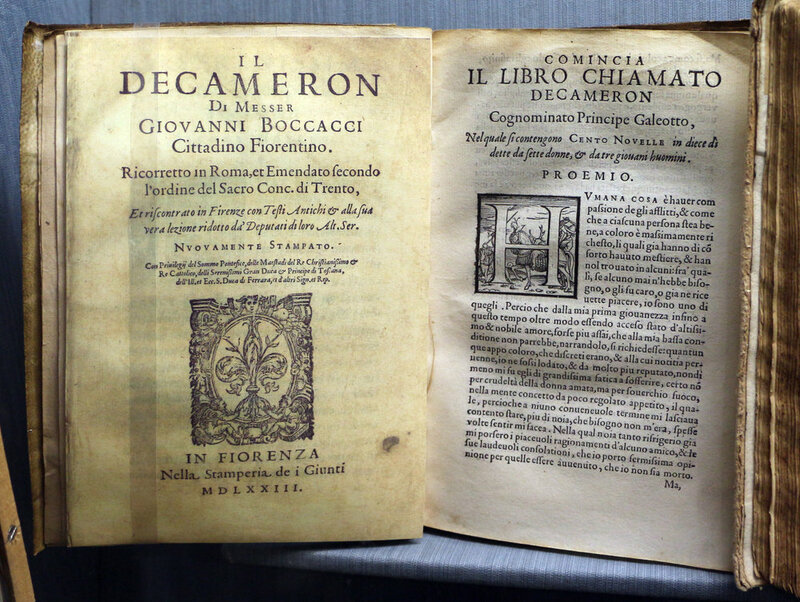 McWilliam, trans., The Decameron, “Second Story” (New York: Penguin Books, 2003), 38.